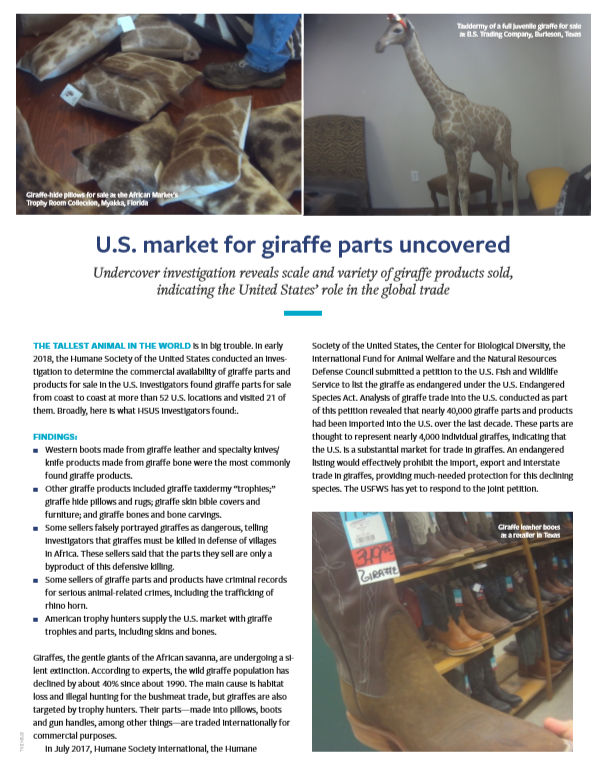 So, United States trophy hunters are enjoying killing slow moving giraffe in increasing numbers – the giraffe species is under threat (“Vulnerable” (IUCN), but heading towards “Endangered“), but some think it’s fun to kill giraffe and turn their body parts/skin into ‘objet d’art’ – a virtually unregulated and sick profiteering exercise based upon wildlife exploitation. Giraffe-hide covered pillows for sale at The African Market Trophy Room Collection, Myakka, FL, March 2018. I am sure deluded trophy hunters and their advocates will try to argue (where’s the scientific proof?) it’s somehow a benefit to conserve giraffe or others species, by blessing the giraffe with ‘value’ as shooting targets and turning the resulting dead giraffe into cushion covers etc. Or, trophy hunters trying to claim giraffes are dangerous (which is simply not true), so in fact ‘brave’ trophy hunters are providing an essential service saving African villagers’ lives – which is just another excuse morphed within the hunters’ self-delusion. The reality is, such trophy hunting is unethical (no matter what the excuses might be) and the hunters’ ‘off-take’ (killing) is contributing to the targeted species’ decline.